Background: In classical homocystinuria (HCU, MIM# 236200) due to the deficiency of cystathionine β-synthase (EC 4.2.1.22) there is a clear evidence for the success of early treatment. The aim of this study was to develop and evaluate a two-tier strategy for HCU newborn screening. Methods: We reevaluated data from our newborn screening programme for Qatar in a total number of 125,047 neonates including 30 confirmed HCU patients. Our hitherto existing screening strategy includes homocysteine (Hcy) measurements in every child, resulting in a unique dataset for evaluation of two-tier strategies. Reevaluation included methionine (Met) levels, Met to phenylalanine (Phe) ratio, and Hcy. Four HCU cases identified after database closure were also included in the evaluation. In addition, dried blood spot samples selected by Met values >P97 in the newborn screening programs in Austria, Australia, the Netherlands, and Taiwan were analyzed for Hcy. Results: Met to Phe ratio was found to be more effective for first sieve than Met, sorting out nearly 90% of normal samples. Only 10% of the samples would have to be processed by second-tier measurement of Hcy in dried blood spots. As no patient with HCU was found neither in the samples investigated for HCU, nor by clinical diagnosis in the other countries, the generalization of our two-tier strategy could only be tested indirectly. Conclusion: The finally derived two-tier algorithm using Met to Phe ratio as first- and Hcy as second-tier requires 10% first-tier positives to be transferred to Hcy measurement, resulting in 100% sensitivity and specificity in HCU newborn screening. The online version of this chapter (doi: 10.1007/8904_2016_556) contains supplementary material, which is available to authorized users. We thank Deborah Treiber and all members of the Newborn Screening Laboratory in Heidelberg as well as the team in the Newborn Screening Units in Austria, Australia, the Netherlands (especially Bert Elvers), Qatar, and Taiwan for excellent assistance and continuous reliable work. This extensive study over more than a decade was only made possible by the continuous and generous support of the Dietmar Hopp Foundation to Georg F. Hoffmann. Systematical evaluation and subsequent implementation of a second-tier test for homocysteine in dried blood spots improve the specificity and positive predictive value for classical homocystinuria screening. Jürgen G. Okun, Hongying Gan-Schreier, and Kathrin V. Schmidt participated in the design of the study and were involved in the experimental setup of the study. Junmin Fang-Hoffmann, Gwendolyn Gramer, Ghassan Abdoh, Tawfeg Ben-Omran, Noora Shahbeck, Hilal Al Rifai, and Abdul Latif Al Khal were involved in the newborn screening process and clinical evaluation of patients. Chuan-Chi Chiang, David C. Kasper, and Bridget Wilcken provided the upper 3% methionine samples of their newborn screening programs. Gisela Haege and Peter Burgard performed the statistical analyses and made substantial contributions to conception and interpretation of the study. Georg F. Hoffmann and Jürgen G. Okun initiated the study, participated in its design and coordination, and drafted the manuscript. 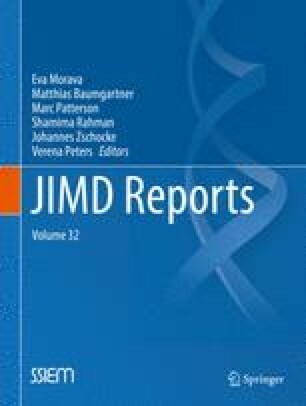 Jürgen G. Okun, Hongying Gan-Schreier, Kathrin V. Schmidt, Junmin Fang-Hoffmann, Ghassan Abdoh, Tawfeg Ben-Omran, Noora Shahbeck, Hilal Al Rifai, Abdul Latif Al Khal, Gisela Haege, Chuan-Chi Chiang, David C. Kasper, Bridget Wilcken, Peter Burgard, and Georg F. Hoffmann declare to have no conflict of interest. This article does not contain any studies with human or animal subjects. All procedures followed were in accordance with the ethical standards of the responsible committee on human experimentation (institutional and national) and with the Helsinki Declaration of 1975, as revised in 2000.